If Seattle had not built lots of housing during the past few decades, its rents and home prices may have approached San Francisco levels of unaffordability. Editor's Note: The following is an excerpt from Randy Shaw's new book, Generation Priced Out: Who Gets to Live in the New Urban America (University of California Press). A Berkeley resident, Shaw is the longtime editor of Beyond Chron and the author of several books. He's also the director of the Tenderloin Housing Clinic, San Francisco's leading provider of housing for homeless adults. The following excerpt represents a case study that Shaw conducted of Seattle's housing market. I asked Shaw if the Express could reprint this portion of his book because it offers important lessons on housing for the Bay Area. Seattle has shown that building dense housing in cities can help keep rents and home prices from soaring out of control, work to help low-income people from being displaced, and is good for the environment. In a recent interview, Shaw said that one of the pivotal differences between Seattle and the Bay Area is that environmentalists in Seattle are very pro-housing in cities, while in the Bay Area, many environmentalists embrace NIMBYism, opposing urban density despite the fact that doing so helps spur suburban sprawl, longer commutes, and more greenhouse gas emissions. "The Sierra Club in Seattle is so strong for housing, whereas that's not the case here in the Bay Area," Shaw remarked. The excerpt, from Chapter 4 of Shaw's book, has been edited for length and style. In 2014, Nick Hodges and Charlotte Wheelock were living with their two kids in Albuquerque, N.M. Wheelock then got a good job offer in Seattle. They did not know much about the Seattle housing market but Hodges told me, "We figured there were a lot of places to live in and around Seattle, so housing was not an issue." They soon learned that Seattle's housing prices were higher than they ever imagined. "We couldn't believe it was so cutthroat. We had figured on staying with friends until we found a place, but as months dragged on, we could not afford anywhere." Wheelock's job offer fell through, and the then 35-year-old Hodges had a recurrence of a health problem that prevented him from working. With Hodges unemployed, Wheelock only able to obtain temporary jobs, and the family using up its resources, they went from living in their car to spending five months in a homeless shelter. This was not the Seattle experience either had anticipated. By 2017, the family was doing well. After staying at Mary's Place, a Seattle shelter, Wheelock began performing various jobs for the nonprofit operating the facility. She was soon hired as an employment specialist and then became the housing director for Mary's Place, supervising a staff assisting homeless families in finding housing. Hodges became head of the Lowell Elementary School PTA. Lowell reflects the new Seattle: The school is across the street from million-dollar houses in the Capitol Hill neighborhood, while 20 percent of Lowell students are homeless. Seattle has seen a sharp rise in homelessness in recent years as housing prices have skyrocketed. In 2017, it had roughly 3,000 homeless people. Hodges explained one reason why: "I've met a lot of people who have been forced out of their homes by big rent increases. Landlords see people coming to town for high-paying jobs and can charge them a lot more for rent than existing tenants can afford. Seattle has no rent control so nothing can be done. A lot of these tenants end up in homeless shelters." Despite Wheelock's job and Hodges's disability payments, they would likely still be priced out of Seattle had they not qualified for a new Section 8 housing development owned by the Compass Housing Alliance. The family pays $1,040 per month for a two-bedroom apartment. Next door to their home is a for-profit-owned apartment building where a unit comparable to their own went for $3,200. Hodges's experience with Seattle's housing market led him to get involved with a new alliance, Housing for All. The group is dedicated to improving Seattle's response to the homelessness and housing crisis. 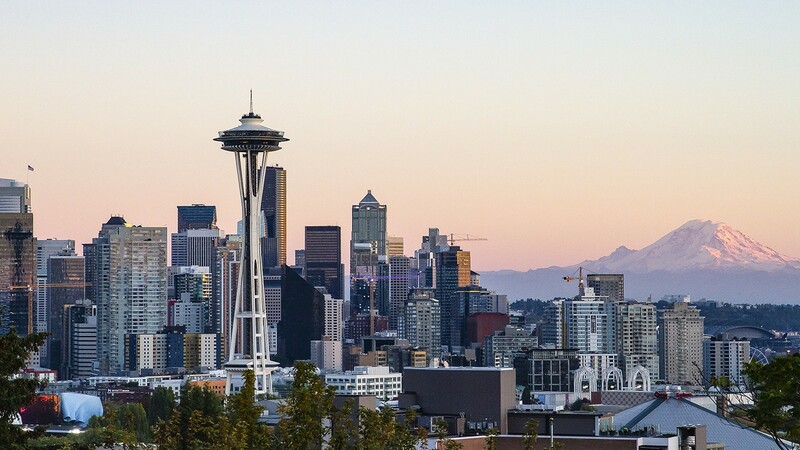 Melissa Dodge's Seattle experience shows just how much Seattle has changed. Melissa has lived in Seattle since 1969. She and her late husband Dennis came as Seattle's economy was plunging. Seattle was akin to a company town, and Boeing, the city's dominant employer, was in freefall. In 1971, Seattle had a 16-percent housing vacancy rate and the nation's highest unemployment. A billboard near the airport read, "Will the last person leaving Seattle turn out the lights." The Dodges paid $75 a month for a one-bedroom apartment in University of Washington housing. Dennis became a full-time employee of the Daily Racing Form in 1976 and spent the next 30-plus years writing columns and handicapping races on tracks in Portland, Yakima, Spokane, Seattle, and Vancouver, British Columbia. Millions of dollars were wagered in reliance on Dennis Dodge's racing picks. Melissa has been a manufacturer's representative for various clothing companies. The couple took advantage of Seattle's slow housing market in 1976 to buy a 1909, three-bedroom, 3,000-square-foot, two-story house north of the University District. They paid $36,000. In 1985, the Dodge family, now with two kids, bought a home in the Laurelhurst neighborhood of North Seattle. It has beautiful views of Lake Washington and Mount Rainier. They paid $223,000. It is now assessed at $1.7 million. Houses on their dead-end street have sold for $2.2 million. For the middle-class Dodges, timing was everything: They got into the Seattle real estate game at just the right time.